Yowzers. Potter has done it again, by whipping up two flirty, irresistible shades for Valentine’s Day! Match is an intense, hot pink…like the top of a match. Grab Match here. 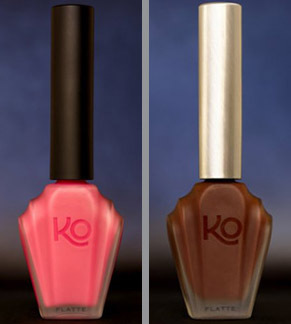 KOKO’s the brilliantly-named deep chocolate brown…like your favorite sweet kiss! Grab KOKO here. Stop by next Sunday and celebrate Valentine’s Day at miomia! – $20 brow jobs with Thomas McEntee. This will be the LAST Sunday he’ll be doing brows at miomia before he heads to Sweden for his makeup tour. So make sure to get your brows in tip-top shape before he leaves. – $20 tarot readings by Lisa Rosman. Got a specific question or problem? Need a quick check-in on your true self? Lisa’s your gal. Plus, we’re offering complimentary mimosas and chocolates…and 10% off your entire purchase. See you Sunday! The newest tome in the Histoires de Parfums collection, Moulin Rouge 1889 gives tribute to Moulin Rouge, the legendary Parisian cabaret. In the heart of Montmartre, the Moulin Rouge stands as a living ode to the famous French Cancan. The most well-known cabaret in the world lights up Paris and never stops turning heads with each new musical revue. This legendary avant-garde landmark has launched the careers of some of the greatest artists in France and worldwide, including Edith Piaf, Ella Fitgzerald, Liza Minnelli, Collette, Mistinguett, and La Goulue, muse of Touluse-Lautrec. This famous burlesque theater was brought to life in 1889, and the new fragrance is a celebration of liberation and passionate, dazzling women. 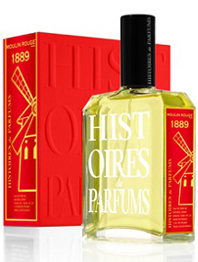 Histoires de Parfums 1889 honors Moulin Rouge with a vibrant, sensual scent, full of vivacity and elegance, with just a hint of feathers and sequins. As the Moulin Rouge, the Belle Epoque is eternal and timeless- the legend is told through the bottle and read through the scent. Miomia will be shipping this extraordinary perfume by next Friday, in time for Valentine’s Day weekend. We’re also offering a fantastic gift for the first 10 people to purchase Moulin Rouge: a complimentary 1969 roll-on and limited-edition Moulin Rouge keychain. To pre-order Moulin Rouge 1889 and to receive your free gift, click here. You are currently browsing the miomia's musings : miomia apothecary blog | shopmiomia.com blog archives for February, 2010.